I have a lot of ties, I mean a lot. I have, like, an eccentric schoolteacher number of ties. And the number keeps growing, and growing. I think on average I get a couple each week, although that is an average from getting none for quite a few weeks and then buying many of them when I get the chance and they have good ties at the local vintage stores. I never really thought about it much, but it seems that I do have quite a few, and I enjoy the more wacky ties. So I thought why not share them with you on the internet. (it wasn’t actually my idea, but I liked it) And as a bonus, we’ll get a look inside the designers heads. 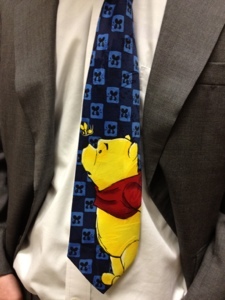 First we have a kind of strange tie depicting Winnie the Pooh and a butterfly. What was going through the designers head: Winnie is a bear right? Bears live in nature right? Butterflies also come from nature. 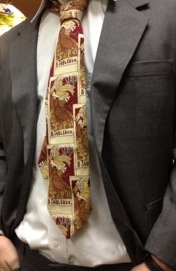 I Just finished my tie design six hours early. Then we have this one, made up entirely of french posters partially covering each other. What the designer was thinking: Man, my poster collection is so cool. If I scanned one in and overlapped it like a collage I’m sure it would be a hit in every market. I think this is my favorite, it’s just a toothbrush and toothpaste. With the toothpaste being three-dimentional. What was going on in the designers head: Crap, isn’t it such a coincidence that I got toothpaste on my tie that looks like it got toothpaste on it. If only the toothpaste had looked more real in the first place, then maybe this wouldn’t be a problem. Wait, I’ve got it. Next we have an uncomfortably close picture of marvin the Martian, made exclusively for six flags. 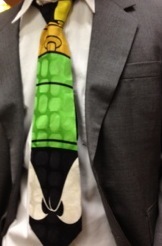 What was going through the designers head: Humph, why do I get stuck with making the marvin tie? I’ll show them. I’ll make it almost unrecognizable. Finally we have one covered in various writing implements and school supplies. What was going on in the designers head: This tape we make for classrooms is great, I wonder what else we can make with this. Steve runs a silk factory, I bet he’ll know!